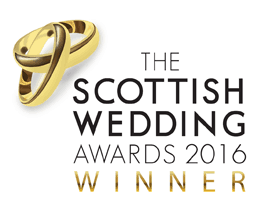 Naked Wedding Cakes- Made and set up at your Venue in Scotland. 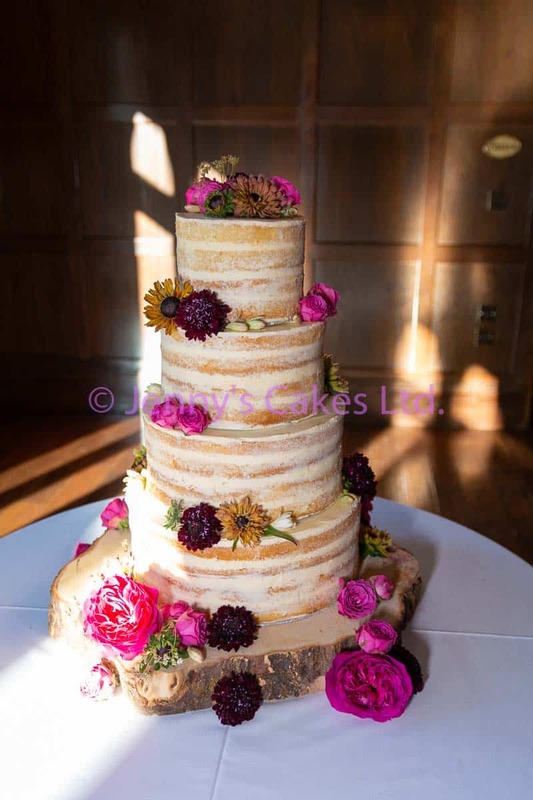 Over the last few years, we at Jenny’s Cakes have made a lots of ‘Naked’ Wedding Cakes, designed to fit in with more relaxed rustic wedding themes. 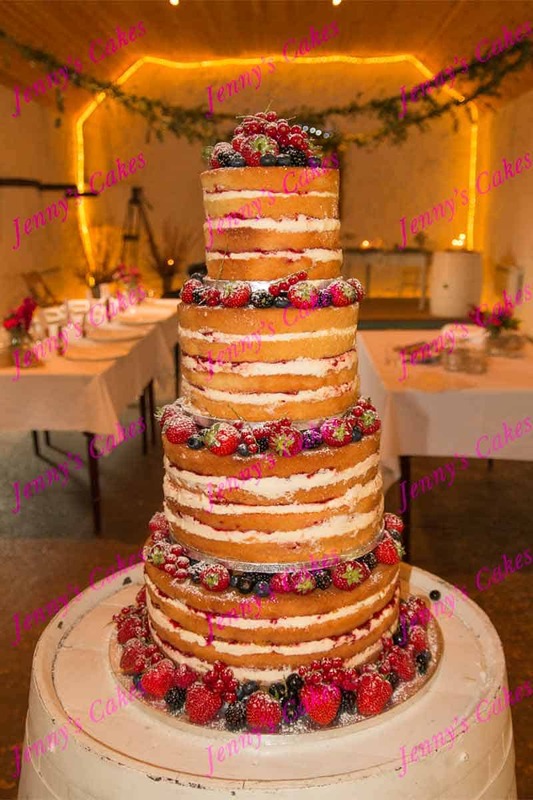 Naked Wedding Cakes are typically stacked together, and often decorated with seasonal berries such as strawberries, blackberries, blueberries and even redcurrant bunches. Sometimes, food-safe flowers or artificial flowers are also used- this is a great way to incorporate details from the bride’s bouquet. 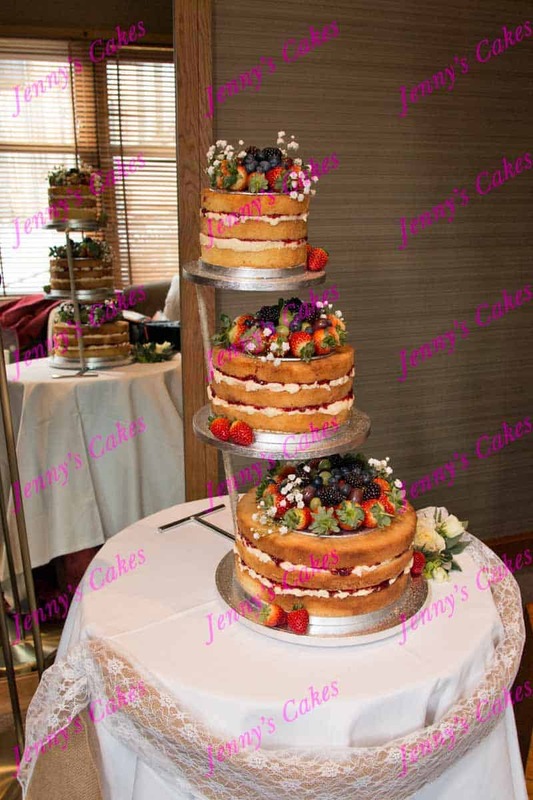 However, as your cake is not coated, we carefully schedule the delivery and set your cake up at your venue in the afternoon of your wedding, to minimise the risk of your cake drying out too much! You can incorporate hessian ribbons and even raffia trim into the cake decor, to complement your table centre-pieces and chair covers, so that the cake echoes the overall look of the wedding and provides an appropriate centre-piece for the all-important cutting the cake photos! 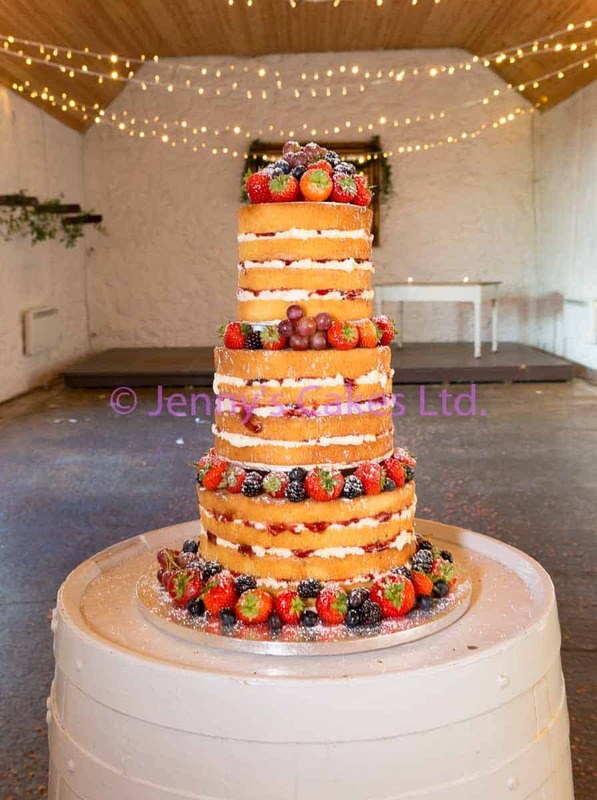 In this post we show some recent naked wedding cake photos, and also semi-naked wedding cake examples to show you a few ideas of cakes to complement a country style wedding. 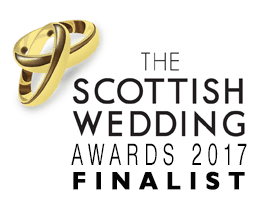 Sizes, number of tiers and cake decoration details can all be adjusted to suit individual tastes and differing scales of wedding, from small intimate family groups, up to larger marquee wedding parties. Naked Wedding Cake with variety of finishes. There are options available in choosing how to display your wedding cake. The cake above (gluten-free victoria sponge as it happens!) is arranged in separate tiers, on a tall metal cake stand. This gives your cake more height, and also gives the opportunity to add more decoration on the top of each of the tiers. In this cake, we have used piles of seasonal berries and some sprigs of gypsophilia. 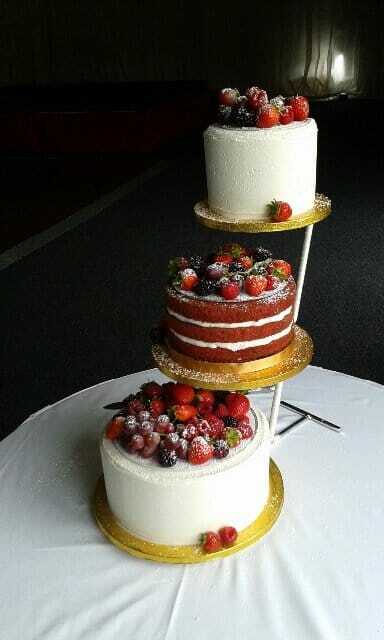 We hope you enjoy these examples of naked wedding cakes suited to a country or rustic wedding theme.